So I’ve been reading some Slam Bradley the last few days. Regular readers might recall that I did a piece on Detective Comics #1 last week, which I read in lieu of reading that ten-dollar monstrosity that was issue 1000. 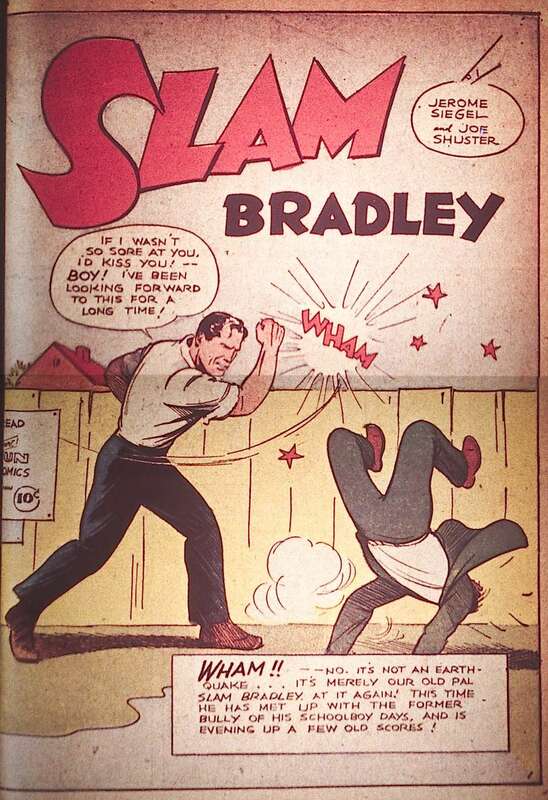 It was fun and insightful, filling in a gap in my funnybook knowledge, but Slam Bradley was the one strip that really stuck out to me as something special. So I continued dipping into the early Detective Comics, just to read it. And I thought that, since it’s the comic I’ve had the most fun with in the last week (and since I’m running too far behind to get a regular column done), I’d share some highlights with you. Heh. And she does, too. Slam is everything she says, and a womanizing ne’er-do-well to boot! 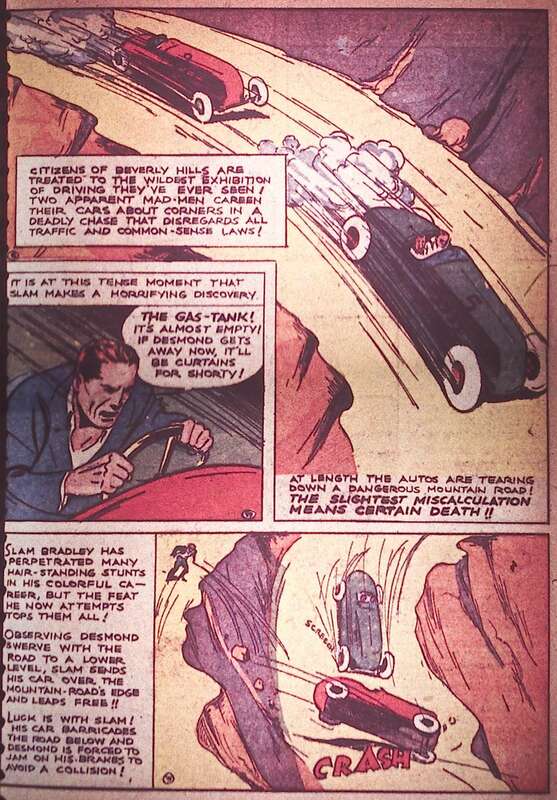 That’s from the second Slam Bradley story, in Detective Comics #2. But we’re getting a bit ahead of ourselves, here. 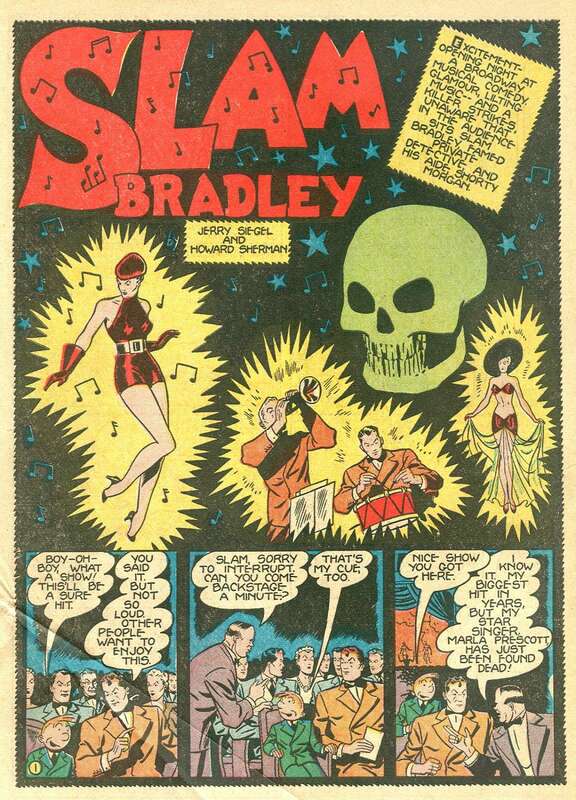 That scene was issue one’s “next issue” blurb, of course, but I repeat it here in color to give you a taste of what these early Slam Bradley strips were like. Which is to say, completely insane. Why is Slam engaging in FISTIC BATTLE with a steel worker? NO ONE KNOWS — OR CARES! I wish I could tell you that the entire story was these two beating the hell out of each other in increasingly creative ways… But, no. We’ve joined the battle in-progress, and Slam lands the final punch in the first panel of the second page. The two men part company, both happy to have found such a good fight. But (PLOT TWIST!) 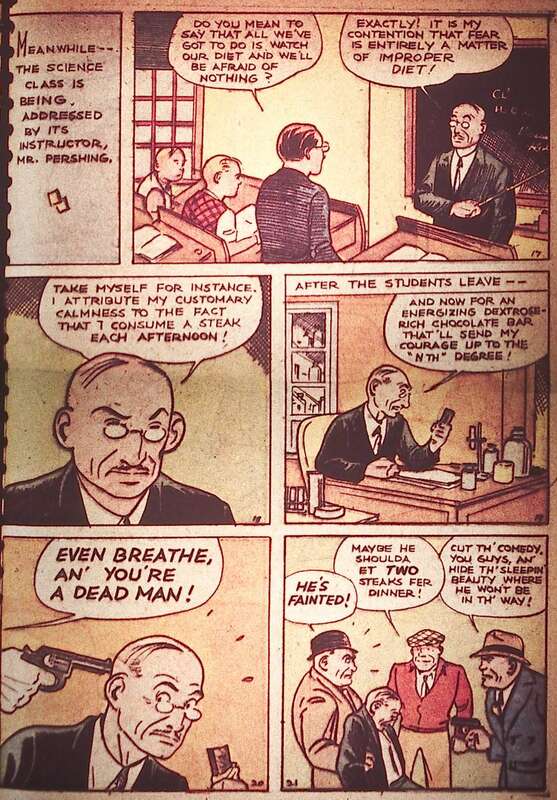 only two panels later, Pete Graves has been murdered! 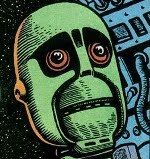 And Slam (having been seen in FISTIC BATTLE with the man only hours earlier) is the primary suspect! By the end of page two, we’re ankle-deep in a murder mystery, and Slam has tossed Graves’ lawyer out the door of the police commissioner’s office. 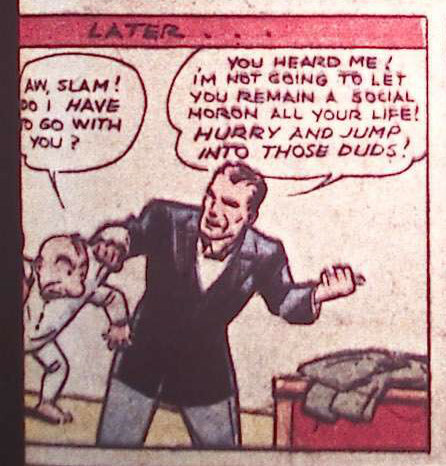 This is the point where a lot of these early Slam Bradleys go wrong: the focus shifts for a few too many pages to Slam’s comedy sidekick Shorty, who winds up doing most of the detective work while Slam’s off somewhere else punching stuff. In this one, Shorty discovers that the “lawyer” is actually the front man for a “racketeering union” who murdered Graves to scare the other steel workers into joining their organization. 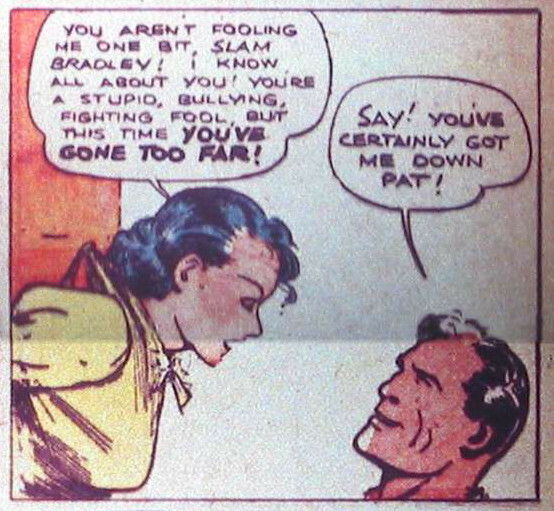 Meanwhile, Slam is confronted (read: shot at) by Graves’ sister, who really thinks Slam killed her brother. That’s her up top there, after Slam has disarmed her. After she pulls another gun out of her dress (! ), Slam races off, rescues Shorty, tosses a thug to his death off an under-construction skyscraper, and gets the fake union boss to confess under similar duress. Detective #3 sees Slam being drawn by guest artist Jim Bettersworth. His more cartoony style suits the strip well enough, but other than a pretty awesome splash page, the story’s kind of forgettable. 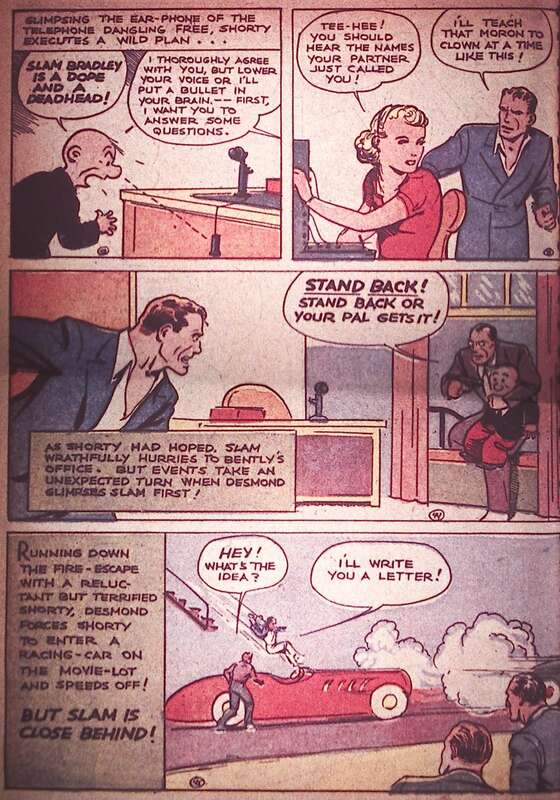 Much better is issue four, in which Slam and Shorty get offered $25.000 to go to Hollywood and become stunt men. Things get fishy pretty quickly, as the driver who picks them up at the airport tries to kidnap them, but Slam (of course) tosses him bodily out of the car while it’s driving down the street. 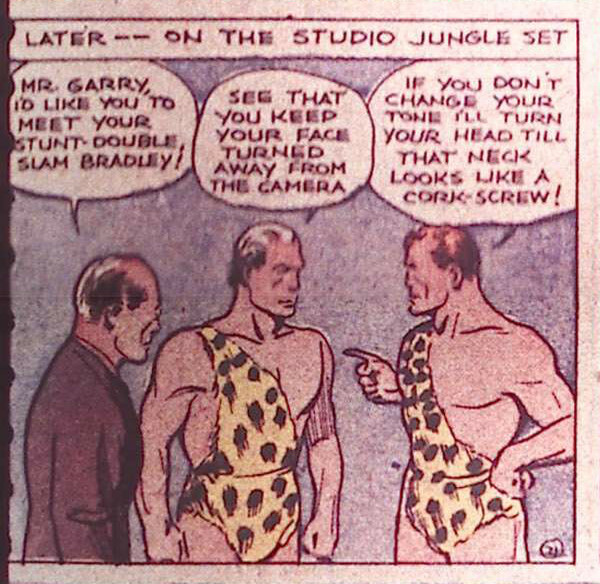 They go on to the movie studio anyway, though, where Shorty works in comedy shorts while Slam is slated to perform as the stunt double for a Tarzan-style jungle lord. His first meeting with the leading man… doesn’t go well. So, yes. 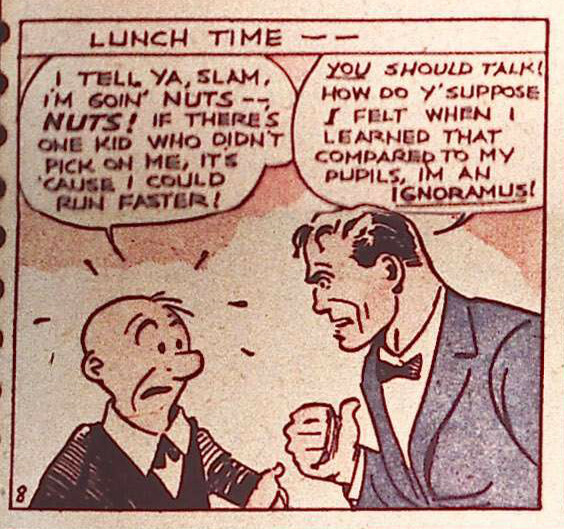 Slam is both an ill-tempered thug AND an unstoppable force of forward motion. Too funny. It’s worth noting the page layouts in that sequence, I think. 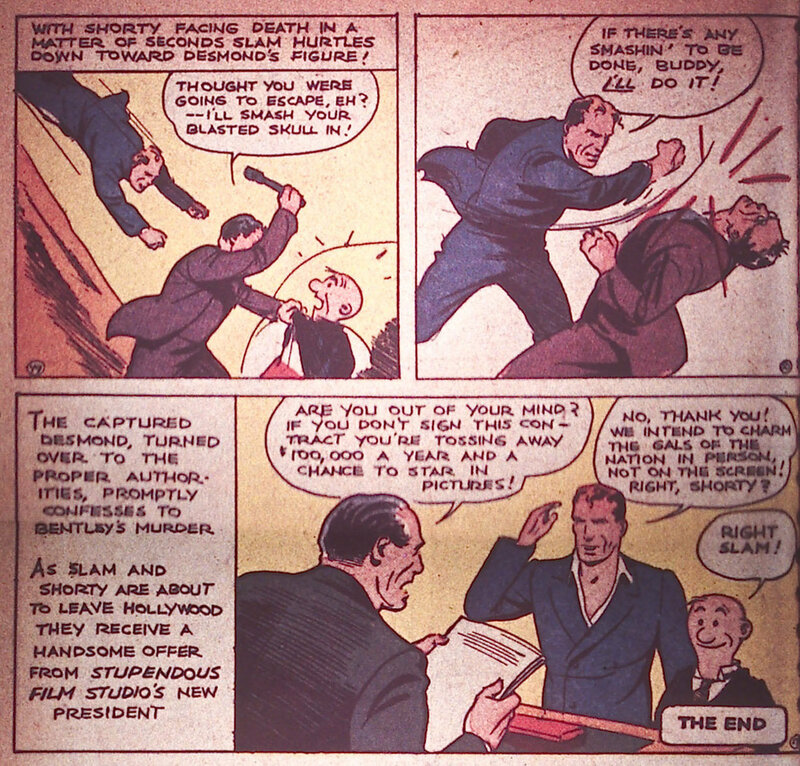 Wheeler-Nicholson’s original proposal to Siegel and Shuster called for eight-panel pages, but the team was so much in demand that they cut that down to six or less to save time. Often, that meant they had to explain between-panel action in narrative captions, rather than drawing it, but they were hardly the only cartoonists in Detective who were filling storytelling gaps that way, so I can’t fault them for it too much. Even at a breezy (for this era) 12-pages, it’s hard to fit everything in. …most of it’s pretty staid-looking stuff. …which looks like it’s going to lead the bloodthirsty Slam toward other old grudges. But, no. 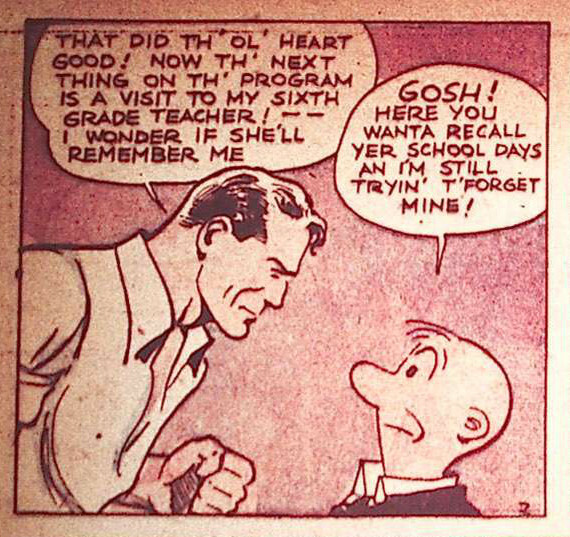 Slam just wants to see his old teacher for sentimental reasons. When she finds out that he’s a detective, however, he gets roped into helping with a mysterious string of school locker break-ins. And before you know it, Our Heroes are undercover, Shorty as a student (because a 30-year-old dwarf can always pass as a middle-schooler) and Slam as a teacher. It… goes about as well as you’d expect. HEH. I really love that one thug’s phonetic dialogue. It’s cliché as all hell, but it reads smooth. Things go about where you’d expect from there. Shorty gets the goods on the bad guys, and Slam punches them into submission. I do like the reason they’re breaking into lockers, though: one of them ran into the school when he was on the lam from some cops and stashed the loot from a bank robbery into one of the lockers … but he doesn’t know which one. Which is bad sit-com writing, I know. But in the world of Slam Bradley, it works. Detective Comics #6 takes Slam and Shorty to Mexico, where they rescue a gold mine operator from some bandits. 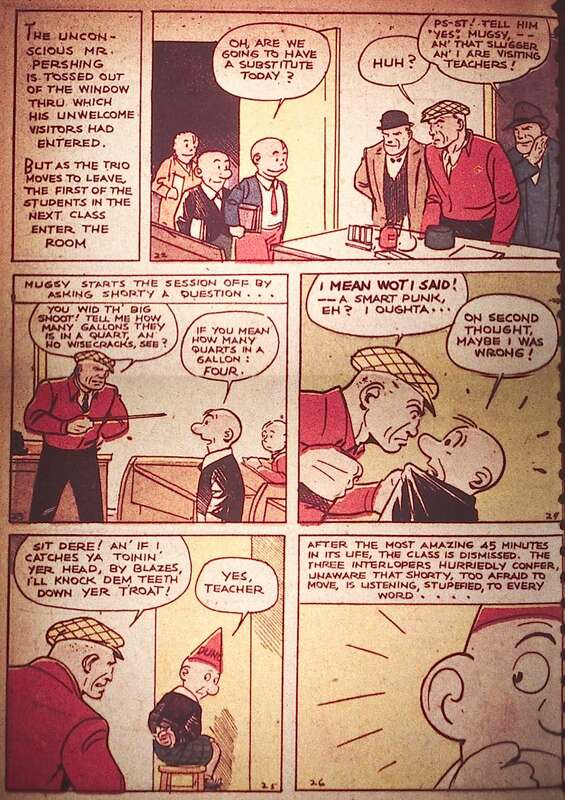 It’s got all the “Frito Bandito” level dialogue you might expect from a 1937 funnybook, and some weirdly racist coloring on the Mexican characters. Their skin is colored a respectful shade of brown, but in some panels Shuster inexplicably chose to “color them in,” covering their faces with ink lines, presumably to make them look darker. It’s not an effect I feel the need to demonstrate here, but it’s pretty weird. 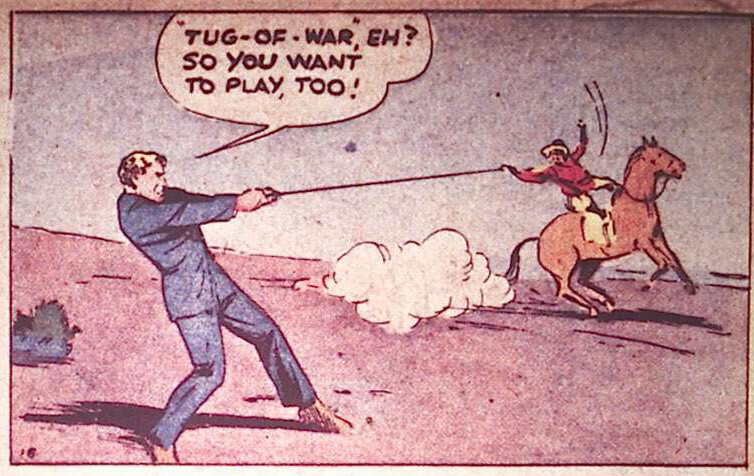 That’s right: Slam Bradley is a jerk, but he’s also so manly that he can yank a man off a horse moving at full gallop! So there you have it: the most fun I’ve had reading comics all week. And I’m not alone in my admiration, either: Slam Bradley ran for 119 consecutive issues of Detective Comics, with a smattering of stories after that ranging all the way to issue 152. At that point, he was replaced with “Roy Raymond, TV Detective” (which sounds way lamer). But that’s still quite a record. 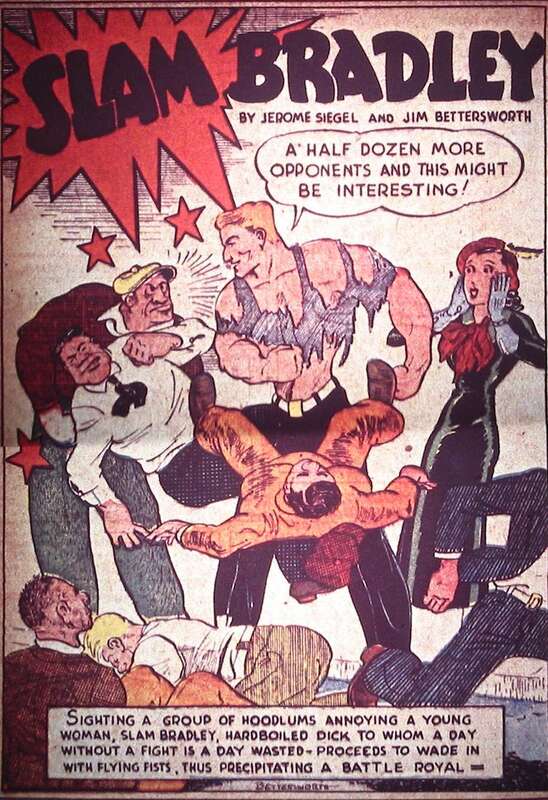 Slam appeared in more issues of Detective Comics than any character other than Batman (to whom he became a back-up feature after the success of issue 27). Pretty cool. But still… Any Slam Bradley story that doesn’t open with him punching somebody in the face just seems wrong to me, somehow. …or Reid Fleming, World’s Toughest Milkman. And, of course, Eric Powell’s Goon owes a huge debt to Slam, as well. So I guess you could say that I’ve had Slam Bradley hard-coded into my favorites for a long time now. No wonder I’m finding it such a revelation. Alright. Thanks for indulging me in this dip into the Golden Age. I hope you enjoyed it, and we’ll get back to more recent comics next time. This was really informative. 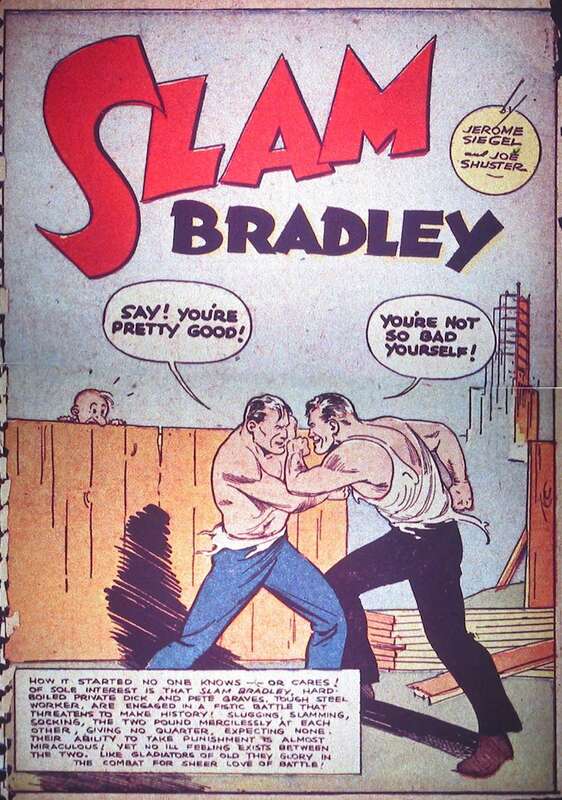 I didn’t know Slam Bradley had been a regular feature in Detective Comics for so long way back when. I thought he was a great supporting character in Ed Brubaker’s Catwoman stories. Yeah, I know Slam primarily from those stories, too. Kinda cool to know what Brubaker was drawing on when he re-wrote him. 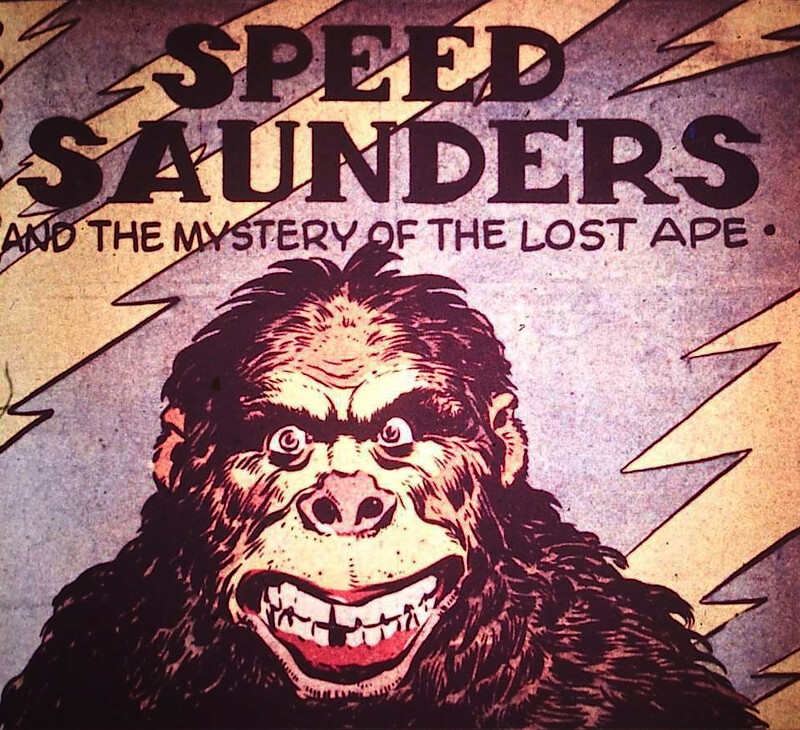 I always thought he was just taking the name, and doing him as sort of an aging Mike Hammer type. But as it turns out, no. I could see this Slam aging into that one.